OVERVIEW. 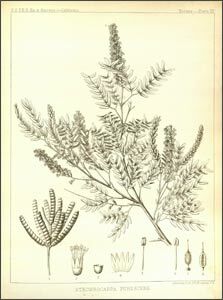 The mid-nineteenth century was an intense period of botanical discovery in the American West, largely as a result of the great survey expeditions mounted by the federal government to further the country's westward expansion. Military forces were present in all the expeditions to protect survey personnel, and at the fore was always the U.S. Army Corps of Topographical Engineers—military officers who had received the best training at West Point and who could deliver survey and engineering data for the reports and competently coordinate the gathering of scientific data and specimens. Civilian appointees also accompanied the expeditions to carry out the more mundane aspects of travel and to gather natural specimens and data, assist the surveyors, and provide illustrations of the landscapes, natural subjects and native peoples. Scientific consultants who did not accompany the expeditions played a key role in collating the collected data and in examining and classifying the specimens sent to them by the expeditions. In all, the expeditions were a huge undertaking that provided the government and scientific community with staggering amounts of information about the lands west of the Mississippi. One month after the start of the Mexican-American War in 1846, a military expedition was sent out from Ft. Leavenworth, Kansas, into the northern portions of Mexico (what is now New Mexico, Arizona and southern California) to capture the town of Santa Fe and continue westward to secure territory in California. 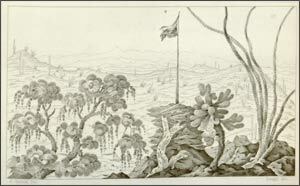 Led by Colonel Stephen Kearney, the "Army of the West" included Lt. William H. Emory, a topographical officer who also served as the expedition’s naturalist, recording the plants he encountered and describing the terrain and the native peoples. Accompanying the expedition was John Mix Stanley, an artist who later became famous for his portraits of Native Americans. 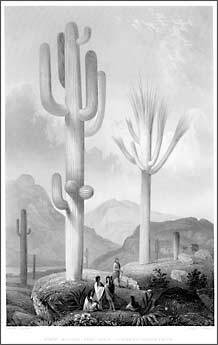 During this reconnaissance, he produced 26 illustrations of Native Americans and scenery, including some of the first images of the giant saguaro. 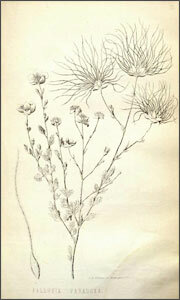 The expedition's route crossed a portion of the Sonoran Desert, which was botanically unexplored at this point, and the 14 botanical plates included in the report are the first scientific illustrations of several unique Sonoran Desert plants. In addition to the military success of the reconnaissance (it was the first US military force to reach the Pacific Ocean by land), the expedition produced the first American account of the peoples, geography, and botany of the region and the most reliable map to date of the territory that was soon to become part of the United States. Emory compiled the expedition’s findings and maps in Notes on a Military Reconnoissance, from Fort Leavenworth,in Missouri, to San Diego, in California, including Parts of the Arkansas, Del Norte, and Gila Rivers which was published by the Thirtieth U.S Congress in 1848. Emory's report was published repeatedly and became a popular travel guide for settlers traveling to California. More than one million square miles of land added to the United States at the end of the Mexican-American War was largely unexplored when the Treaty of Guadalupe was signed in 1848. A defined boundary was needed between the two countries, and the Treaty required each country to appoint a survey commission to establish this boundary. The first American commission, led by John Russell Bartlett of the U.S. Army Corps of Topographical Engineers, began its work in 1850, proceeded slowly west and then returned east, when in 1852 the Commission was abruptly disbanded by the Secretary of the Interior	because of a disputed decision over a segment of the southern boundary with New Mexico. This left the boundary survey incomplete. In the same year, Lt. James Gadsden was sent to Mexico to purchase additional land from Mexico. 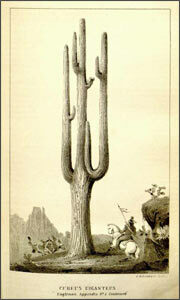 What is now the southern portions of New Mexico and Arizona were acquired for $10 million in 1853. The need for a boundary became more pressing, and the idle Boundary Commission was reorganized in 1854 under the command of Major William H. Emory. Emory, also of the Corps of Topographical Engineers, had served under Bartlett in the first boundary survey expedition. He was by all accounts a more focused and capable officer, and he completed the survey by August of 1855. Maps were completed by 1857, and the final report was printed in 1859. The Commission’s work was accurate enough that their established boundary is still used today, with an occasional adjustment to accommodate the changing course of the Rio Grande. Emory’s final report includes scientific accounts from both his expedition and the earlier one led by Bartlett. Its two volumes contain survey results, personal accounts by expedition officers, and a vast inventory of scientific data, complete with highly detailed illustrations. 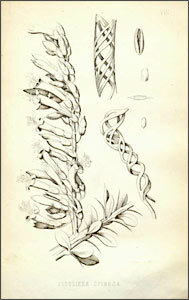 Volume 2 contains sections on botany and zoology. Accompanying Emory on the expedition were many civilian appointees. Arthur Schott, John Weyss, and Augustus de Vaudricourt were artists who also served as scientists and surveyors. Of these, Arthur Schott may have had the most diverse duties, as he served also served as a specimen collector. Other civilians joined the expedition as plant collectors: Charles Parry, Charles Wright, George Thurber, and John Bigelow. 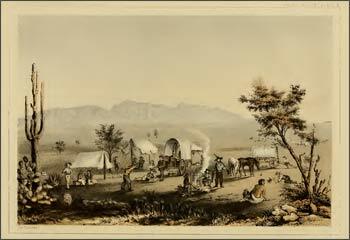 Most of the landscape and geographical drawings in the first volume were done by Schott, who also made paintings of some of the Native Americans they met during the survey. 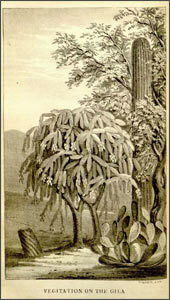 One such portrait (above right) depicted Papago (Tohono O'odham) women collecting fruit from an organ pipe cactus. 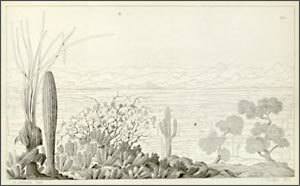 Schott and Weyss each contributed 32 drawings of landscapes along the boundary, which show a wide variety of Sonoran Desert plants. The practice of the Corps of Topographical Engineers was to gather data and specimens along their route to send to civilian specialists who would analyze, categorize, and illustrate them, all in the confines of their offices, herbaria, or institutions. These scientists and artists did not accompany the expeditions, but the final reports depended heavily upon their expertise and talents. 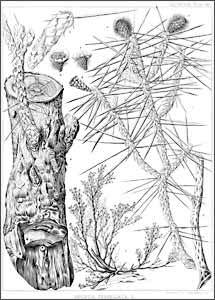 In the case of the Boundary Survey, the botanical report (Botany of the Boundary) was written by John Torrey, the prominent American botanist who was busily engaged in trying to complete his Flora of North America with his assistant Asa Gray. Sadly, the illustrator(s) of the plates for this section are not noted in the Report; it is thought that some of these illustrations are by the artist Isaac Sprague who worked with both Gray and Torrey. 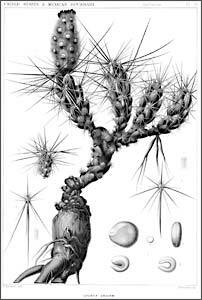 The survey’s section on cactus (Cactaceae of the Boundary) was written by George Engelmann, the St. Louis physician/botanist, and was beautifully illustrated by Engelmann’s colleague Paulus Roetter . These men did not physically examine their specimens in the field but rather waited for collections to be delivered to them. 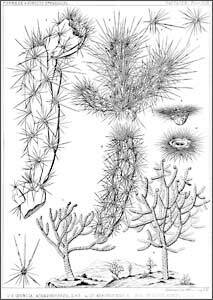 Members of the survey expedition were honored by having several new plant species named for them, among them being Dalea emoryi, Acacia schottii, Cereus roetteri, Carex thurberi, Saxifraga parryi, Baccharis bigelovii, and Mammillaria wrightii. Before the California Gold Rush (1848–1855), the primary route for migration into the West was the Oregon Trail. Difficult terrain to the south and conflicts with Indian tribes restricted travelers to this 2000-mile trail from Independence, Missouri, to Oregon City, Oregon. But this route was perilous, as well, and became impassable in winter. When gold was discovered in California and silver struck in Nevada, the need for a transcontinental railroad became urgent. "Valley Along the Gila and Sierra de las Estrellas from the Maricopa Wells"
With the territorial acquisitions resulting from the Mexican-American War and the Gadsden Purchase, the government was presented with new possibilities for finding a route for the railroad. The Army’s topographical engineers preferred a southern route along the new border with Mexico because it offered optimal climate for year-round travel. Northerners, however, wanted a route closer to the Oregon Trail. To settle the matter, Secretary of War Jefferson Davis authorized a survey of four possible routes. These surveys were conducted between 1853 and 1855 by the U.S. Army Corps of Topographical Engineers, which had recently completed surveys of the new border separating the United States and Mexico. In addition to the Corps’ engineers, these expeditions included scientists, naturalists, artists, and draftsmen to make a record of the terrain and its inhabitants. Many of the officers of the survey expedition had received some scientific training at West Point and were able to provide sketches, compile data, and collect specimens for later study by scientists in the East. As some of the proposed routes passed through newly acquired territories that were relatively unexplored, the reports described not only the surveyed routes, but also reported on natural history—the geology, paleontology, plants, and animals, as well as descriptions of the Native Americans living in the territory. The best documented survey expedition was that of Lt. Amiel Whipple, which followed the 35th parallel from Oklahoma into New Mexico and Arizona and ended in Los Angeles. 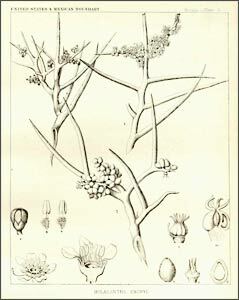 The Whipple expedition's official artist was Heinrich Balduin Möllhausen, who recorded landscapes and contributed to some of the botanical drawings. 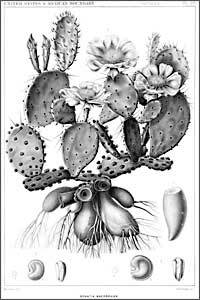 The botanical report for the 35th parallel survey included a section on Cactaceae by George Engelmann, who had also authored a similar report for the U.S.-Mexico Border Boundary Survey. 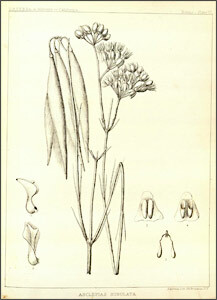 The artist for both these reports was Paulus Roetter, but for the Railroad Survey report, Roetter's drawings were supplemented by Möllhausen's field sketches of cylindropuntias. The reports created by the surveys were published between 1855 and 1860 and comprised 12 volumes, which presented a mountain of scientific reports and an impressive number of highly detailed illustrations. The information gathered by the engineers and naturalists was of sufficient quality as to be studied by American and European scholars for many years thereafter. Even today, the reports hold endless fascination—the excitement of an undiscovered territory framed by the enormous tragedy of the historical period which ultimately overshadowed public appreciation of expeditions’ enormous accomplishments. And what of the actual construction of the railroad? After receiving the four survey reports, Secretary Davis chose the southernmost route (from Texas through southern Arizona to San Diego) with its ideal climate as the shortest and most economical route. But the uproar from the proponents of the Northern route created deadlock in Congress, and nothing was done to further construction of the railroad until 1862 when President Lincoln signed the Pacific Railroad Act. In the end, the route chosen was a middle way which largely conformed to the Mormon Trail. It was built in two segments, one heading westward from Omaha (the Union Pacific Railroad Company) and one heading eastward from Sacramento (the Central Pacific Railroad Company), and in 1869 the two segments were connected in Promontory, Utah, to complete the transcontinental railroad. Goetzmann, William H. Exploration and Empire—The Explorer and the Scientist in the Wining of the American West. New York: Alfred A. Knopf 1966. Kelsey, Robin. Archive Style—Photographs and Illustrations for U.S. Surveys, 1850–1890. Berkeley and Los Angeles: University of California Press, 2007. Reinhartz, Dennis and Saxon, Gerald D., Editors. Mapping and Empire—Soldier-Engineers on the Southwestern Frontier. Austin: University of Texas Press, 2005. Reveal, James. 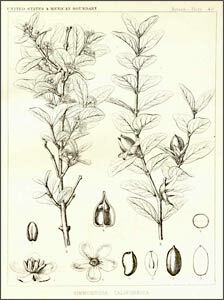 Gentle Conquest—The Botanical Discovery of North America with Illustrations from the Library of Congress. Washington, D.C.: Starwood Publishing, Inc., 1992. Taft, Robert. Artists and Illustrators of the Old West 1850–1900. New York: Charles Scribner's Sons, 1953. Wallace, Edward S. The Great Reconnaissance. Boston: Little Brown and Company, 1955.